Here's a quick ode to my new coffeemaker, the Bialetti Brikka. 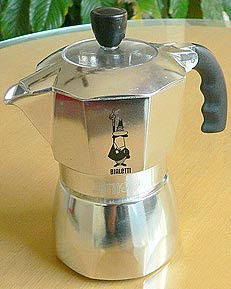 Bialetti's coffee machines seem to be one of the few areas of contemporary Italian innovation. This machine has only been on the market for a few years, and is an upgrade to the venerable Bialetti Moka pot. I say upgrade as its larger base and new spout enables the machine to build more pressure than the moka, resulting in coffee with more body and richness. 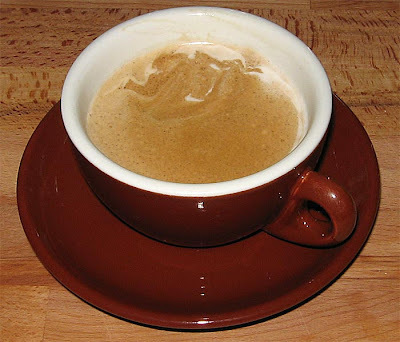 In addition, it creates a crema that matches an espresso in terms of appearance if not in taste. The end result is not quite espresso, it lacks the complexity and depth of a good espresso, but it's as close as you'll get without buying an espresso machine. With a little hot milk it makes a very nice cappuccino.